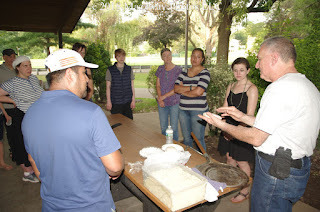 On Monday-16-July the Bogota Public Library held the first meeting of the Library's newest book club. 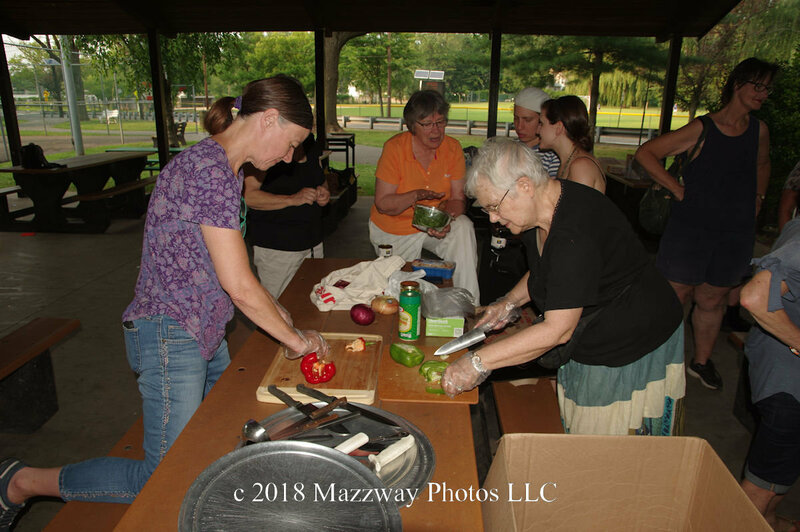 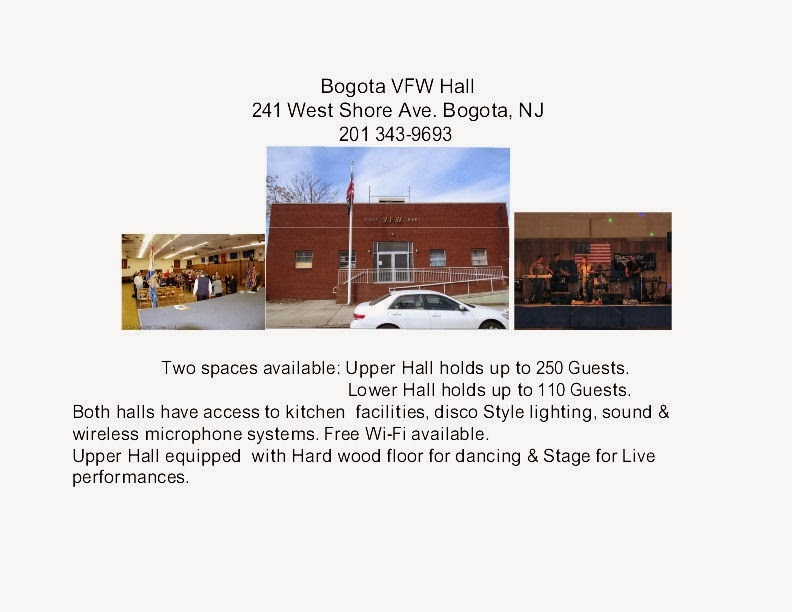 Bogota's Test Kitchen will have participants explore a selected cookbook a month then bring a dish from that book in a book club pot luck dinner while discussing the material. 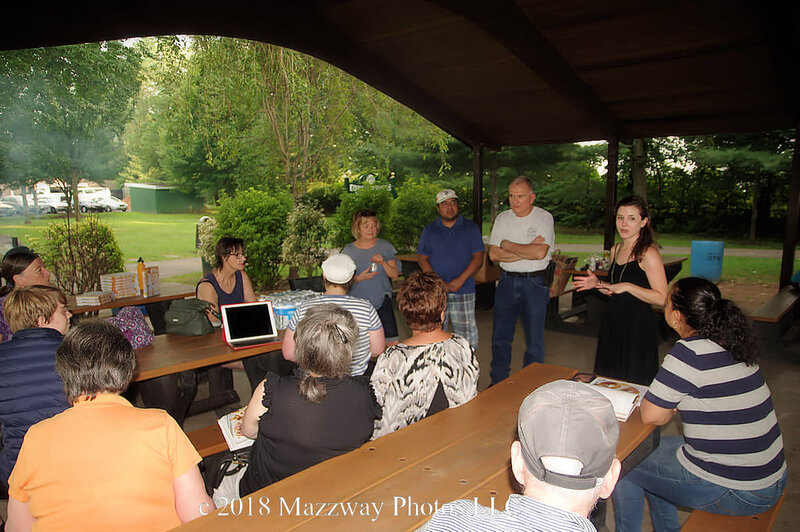 This first meeting was held in the picnic shelter in Olsen Park. 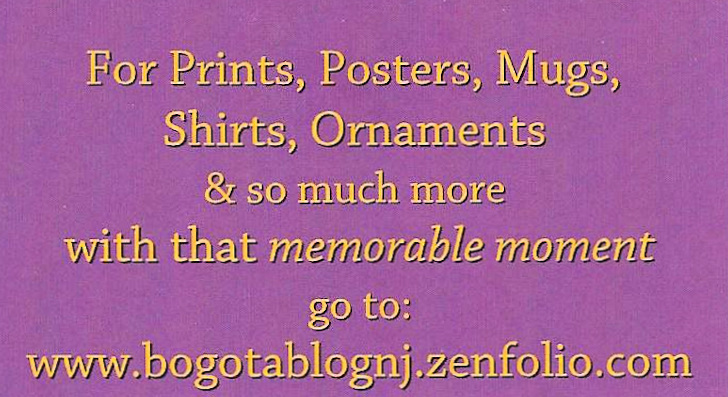 This was to introduce the the members to each other and pick-up copies of the first book to be looked at. 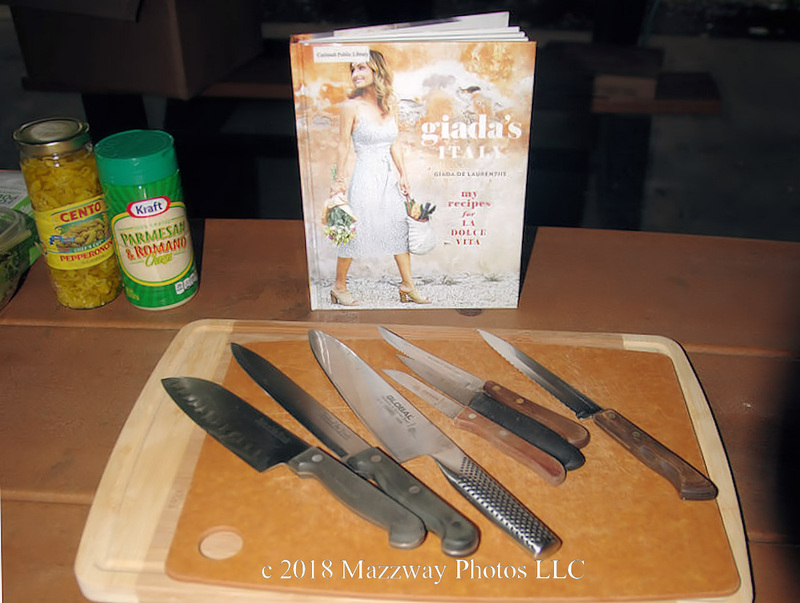 The inaugural book chosen was Giada's Italy featuring recipes by Giada De Laurentiis. 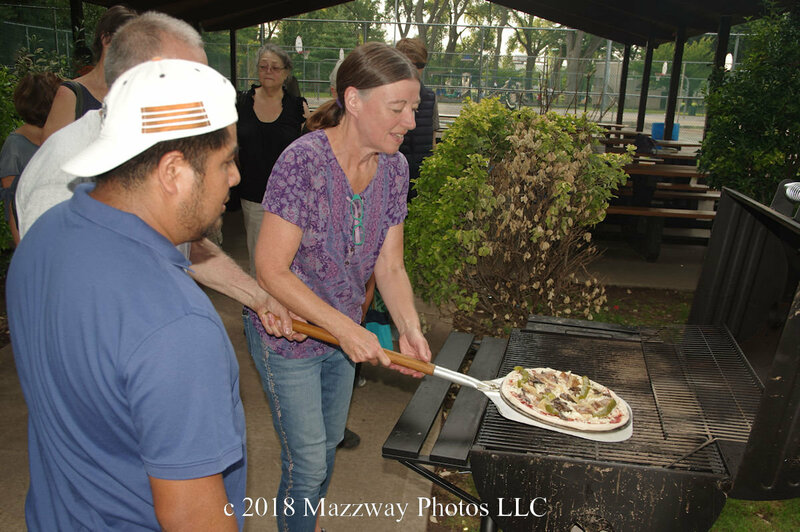 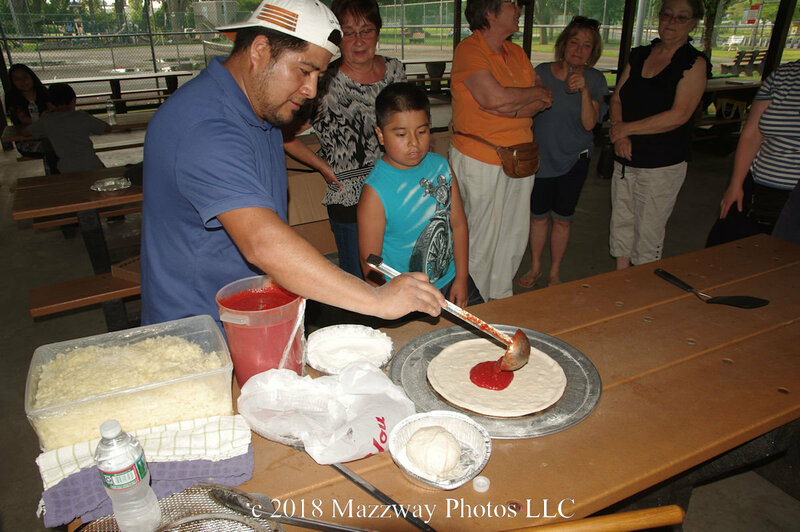 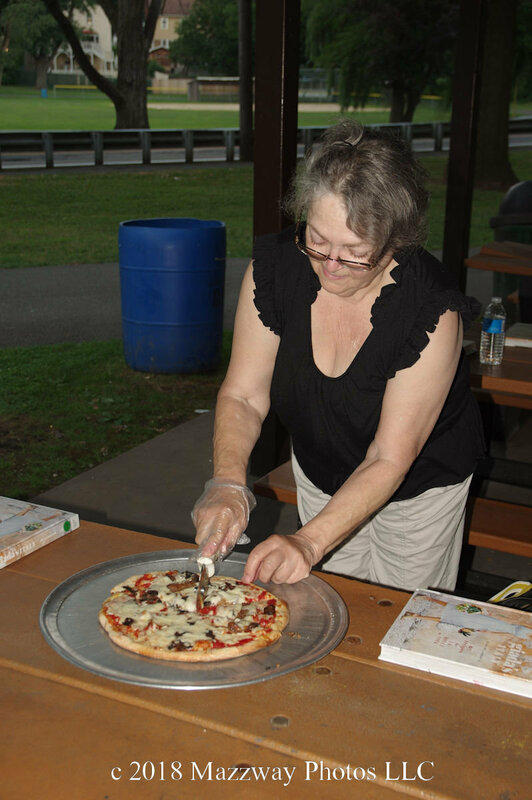 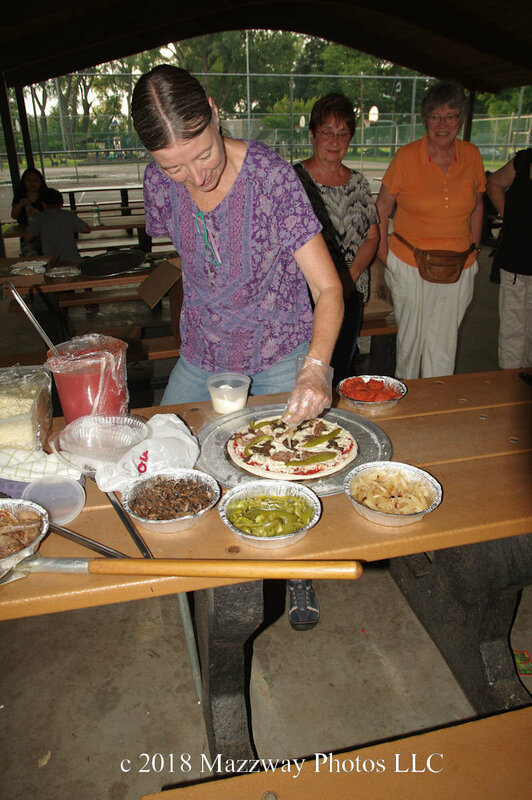 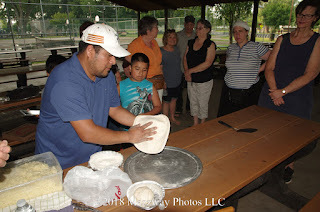 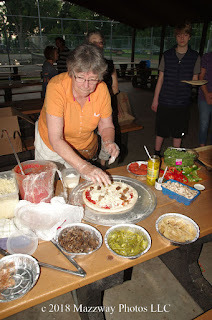 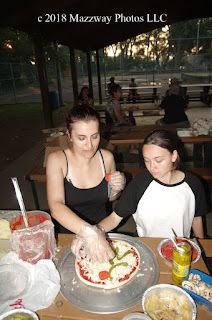 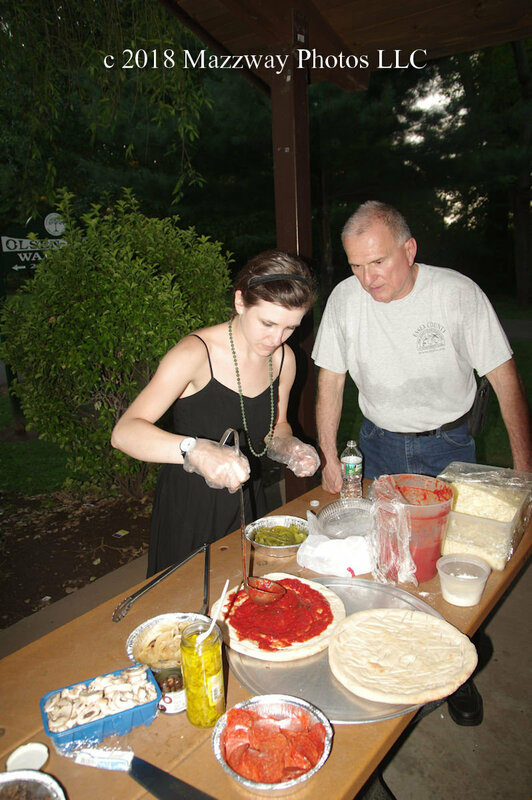 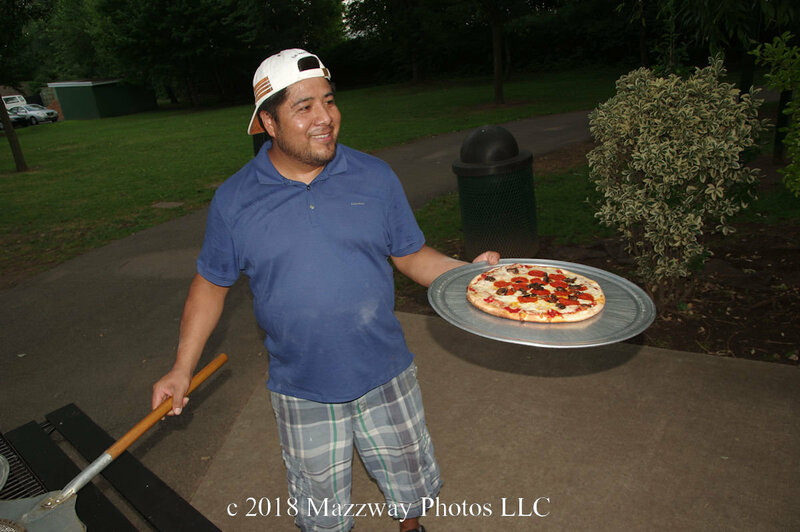 To set the mood for the idea of Italian cooking Cafe Europa Pizzeria Owner Vittorio Guerrtni , and Head Cook Javier Aparicio guided the attendees in art of pizza making. Mr. Aparicio first shown how to create a the pizza crust from fleshly made dough, and shape it into a platform for topping to be added. 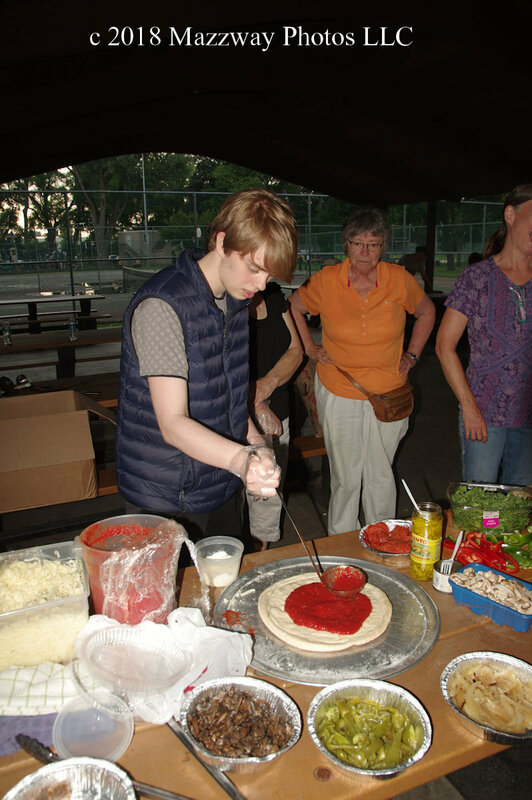 He displayed an efficient method of adding sauce, then building the rest with layers of cheese and toppings. Then the members had a chance to create their own personal pizza under the watch eye of Mr. Guerrtni, who offer suggestions and talked his experiences running a food business. Each member was given their own pre-made shell and there free to create an item based on what they were in the mood for this evening. 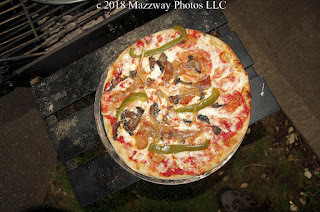 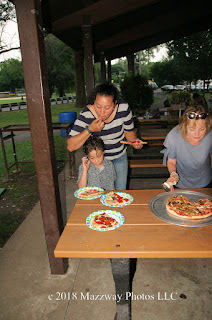 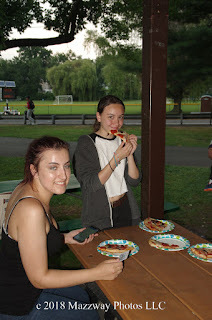 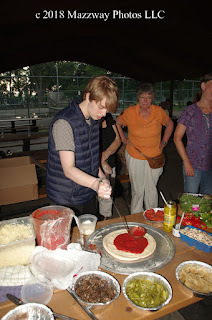 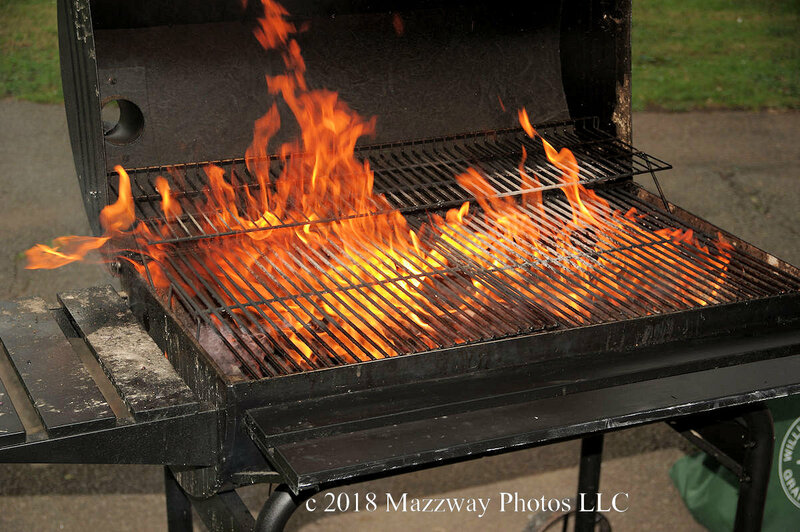 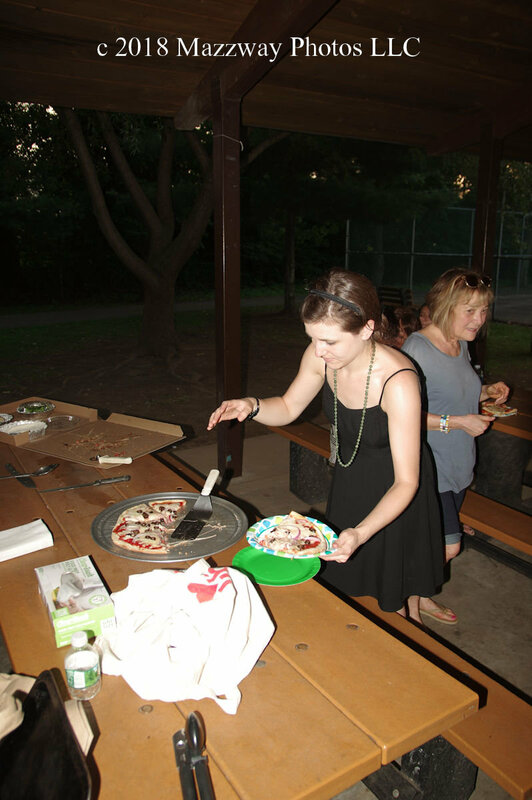 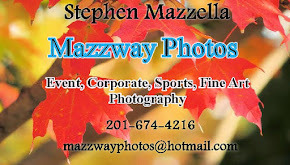 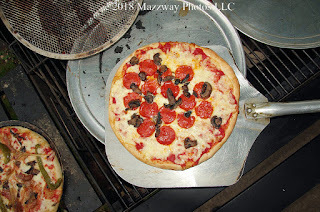 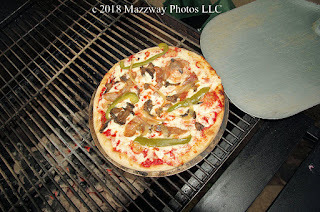 The pizza was cooked over hot charcoals and was then able to tasted by the creator and others. This was a interactive start to the cooking book club. 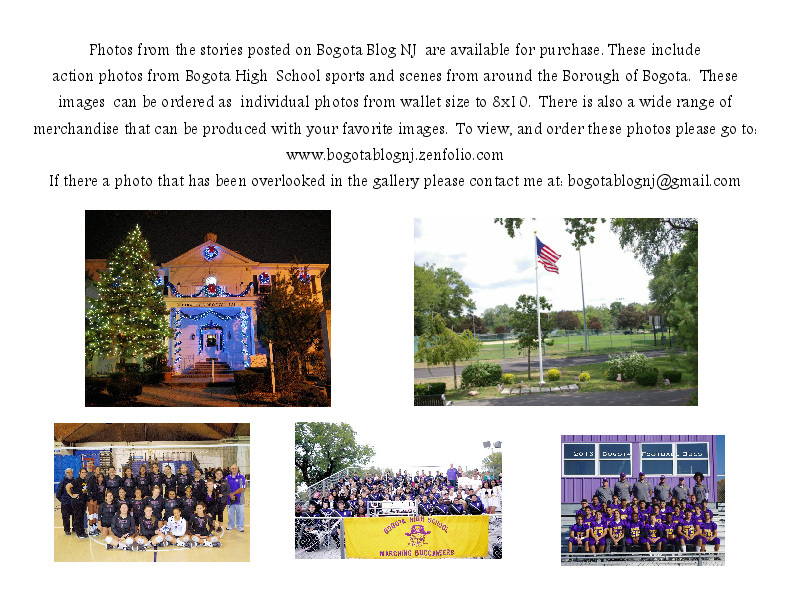 Those who did not already have the first book in the series could check it out there, and told about the next step. 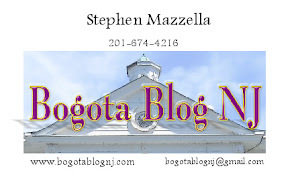 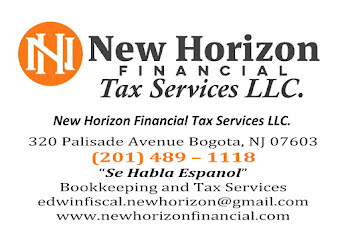 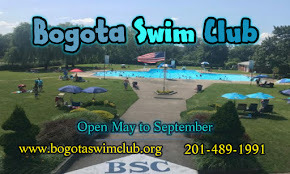 The next meeting will be on Monday-20-August and be held in the second floor of the Bogota Library. 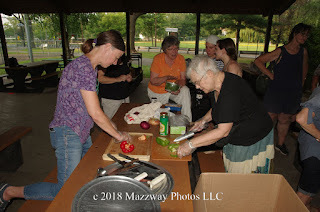 At the next meeting members are to bring a recipe from this month book, and serve it to the other members as a potluck dinner. While over dinner members can discuss the book, why the chose their dish, and what was it like in the cooking process.